Conventional transparent film thickness measurement methods such as spectroscopy are essentially capable of measuring only a single point at a time, and their spatial resolution is limited. We propose a film thickness measurement method that is an extension of the global model-fitting algorithm developed for three-wavelength interferometric surface profiling. It estimates the film thickness distribution from an interference color image captured by a color camera with three-wavelength illumination. The proposed method is validated through computer simulations and experiments. T. S. Hyvarinen, E. Herrala, and A. Dall’Ava, “Direct sight imaging spectrograph: a unique add-on component brings spectral imaging to industrial applications,” Proc. SPIE 3302, 165–175 (1998). M. Ohlidal, V. Cudek, I. Ohlidal, and P. Klapetek, “Optical characterization of non-uniform thin films using imaging spectrophotometry,” Proc. SPIE 5963, 596329 (2005). G. Jin, R. Jansson, and H. Arwin, “Imaging ellipsometry revisited: developments for visualization of thin transparent layers on silicon substrates,” Rev. Sci. Instrum. 67, 2930–2936 (1996). T. Sato, T. Araki, Y. Sasaki, T. Tsuru, T. Tadokoro, and S. Kawakami, “Compact ellipsometer employing a static polarimeter module with arrayed polarizer and wave-plate elements,” Appl. Opt. 46, 4963–4967 (2007). S. Parthasarathy, D. Wolfe, E. Hu, S. Hackwood, and G. Beni, “A color vision system for film thickness determination,” in Proceedings of IEEE Conference on Robotics and Automation (IEEE, 1987), pp. 515–519. 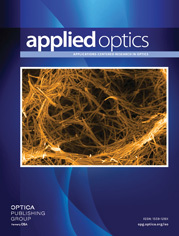 D. Birnie, “Optical video interpretation of interference colors from thin transparent films on silicon,” Mater. Lett. 58, 2795–2800 (2004). M. Kubo, Y. Ohtsubo, N. Kawashima, and H. Marumo, “Head slider flying height measurement using a color image processing technique,” JSME Int. J. 32, 264–268 (1989). M. Hartl, I. Krupka, R. Poliscuk, and M. Liska, “Computer-aided evaluation of chromatic interferograms,” presented at Fifth International Conference in Central Europe on Computer Graphics and Visualization, Plzeň, Czech Republic, 10–14 February1997, pp. 45–54. M. Eguchi and T. Yamamoto, “Film thickness measurement using white light spacer interferometry and its calibration by HSV color space,” presented at 5th International Conference on Tribology, Parma, Italy, 20–22 September2006. K. Kitagawa, “Multi-wavelength single-shot interferometry without carrier fringe introduction,” Proc. SPIE 8000, 800009 (2011). K. Kitagawa, “Single-shot surface profiling by multi-wavelength interferometry without carrier fringe introduction,” J. Electron. Imaging 21, 021107 (2012). K. Kitagawa, “Fast surface profiling by multi-wavelength single-shot interferometry,” Int. J. Optomechatronics 4, 136–156 (2010). R. Fletcher and M. J. D. Powell, “A rapidly convergent descent method for minimization,” Comput. J. 6, 163–168 (1963). C. Tilford, “Analytical procedure for determining lengths from fractional fringes,” Appl. Opt. 16, 1857–1860 (1977). Fig. 1. Flowchart of the proposed algorithm. Fig. 2. BGR intensities and synthesized color chart as a function of film thickness. Fig. 3. Optical setup for three-wavelength interference color imaging. Fig. 4. Principle of the GMFT method in the case of three wavelengths and n-point fitting. Fig. 5. Phase unwrapping by the coincidence method. Fig. 6. Cross section of the target thickness profile used for the simulations. Fig. 7. Synthesized color image. Fig. 8. BGR images and the three points used for fitting. Fig. 9. Observed intensities for three-point fitting. Fig. 10. Estimated thicknesses from three-point fitting. Fig. 11. Intensity profiles for 50-point sets. Fig. 12. Estimated thicknesses obtained with 50-point fitting. Fig. 13. Phase profiles calculated by the ACOS method. Fig. 14. Estimated thicknesses of 50 points obtained with the ACOS method with the recipe obtained with GMFT three-point fitting. Fig. 16. Spectral transmittance of the multibandpass filter. Fig. 17. Sensitivity of the three CCDs of the color camera. The wavelengths used in the experiment are indicated. Fig. 18. Target thickness standard. Fig. 19. Stitched color image of thickness standard, and six points for GMFT fitting (shown in white numbers). Fig. 20. Estimated thicknesses of six points obtained using GMFT fitting. Fig. 21. Estimated thickness profile by the ACOS method. Fig. 22. SSE versus thickness error. Fig. 23. Estimated thicknesses by two GMFT fitting algorithms, i.e., local and global optimization methods, all with initial thicknesses of 300 nm. Fig. 24. Color image of the 300 nm thickness standard, and the point used for GMFT-1 fitting (indicated by the white number). Fig. 25. Estimated thickness profile of the region of the thickness standard that is nominally 300 nm in thickness, as obtained by GMFT-1 fitting. Fig. 26. Relationship between the estimated thicknesses of the region that is nominally 300 nm in thickness and the illumination intensity obtained by using the original recipe and GMFT-1 algorithm.